Marketing may have entered the golden age of data, but the future will be about software driving data and marketers acting as customer relationship navigators, Marketo’s founder and CEO claims. During the opening keynote of the Marketo Marketing Nation conference in San Francisco, Phil Fernandez pronounced the era of mass media and planned email campaigns “dead” and said the future is about engaging and building trust with customers off the back of data. But while it’s clear CMOs today have access to more data than ever before, diving into that growing pool of information isn’t going to be possible without technology and automation. Fernandez pointed to self-driving cars as an analogy for what the future of data-driven marketing needs to look like. While there is a wealth of data behind the self-driving car, drivers aren’t trying to get their hands on it or understand what each data point tells them, he said. Modern marketers need to take a context-based approach and embrace “engagement marketing”, Fernandez said. “The trouble with mass advertising is we have brought out the nuclear weapons at this point: We keep doing it, but it’s ringing false,” he commented. “We’ve taken the same ideas and put these onto the Web. This isn’t engagement or building a relationship, it’s just irritating customers. Fernandez explained engagement marketing as building long-term relationships based on trust. To do this, marketers need to listen and respond at “every arc of the customer lifecycle”, rather than try and draw their own map based on what they think customers will do, he said. Modern marketing also isn’t just about securing a purchase, but renewing, upselling and upgrading. “It’s not just about what we say but how, when, where we say it, and what the cadence is,” he said. “Today we still think about weekly lead nurturing campaigns, but in fact some people may want a lot of communication, or a combination of email and push mobile messages; some don’t want an email that often. One emerging opportunity that could transform marketing further is the Internet of Things. Fernandez suggested connected devices like the Apple Watch, fitness trackers, digital thermostats and connected fridges are the new marketing channels. This hyper-connected world could even see marketers putting personalised messages on a pill bottle for a particular consumer just as easily as sending an email today, Fernandez said. “These new pallets are very exciting but requires significant change in way we organise marketing departments,” he warned. “We’ve been creating specialised marketing teams for mobile, social, but are you going to have specialists in pill bottles? We have to find different ways of doing this. 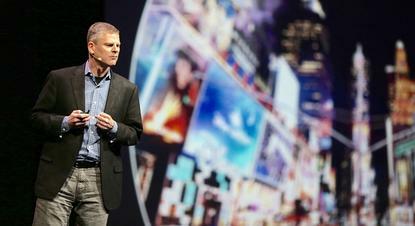 That requires a seamless experience regardless of platform or device, Fernandez said. With customer relationships becoming the most important assets to an organisation, Fernandez added that puts the CMOs in a very powerful position.